Direct thermal labels do not require ribbons when printing. Please check your printer model or if you are unsure please call 888-325-2626 for assistance. If you are sure these are the items you need, please check the box below and continue checking out. BLANCO will be closed on Friday, April 19 to commemorate Good Friday and the Easter Holiday. Any custom label available. Call for quote 888-325-2626. "Quality labels, ink and ribbons for desktop and commercial printers"
Sheet Size: 8-1/2 In. X 11 In. 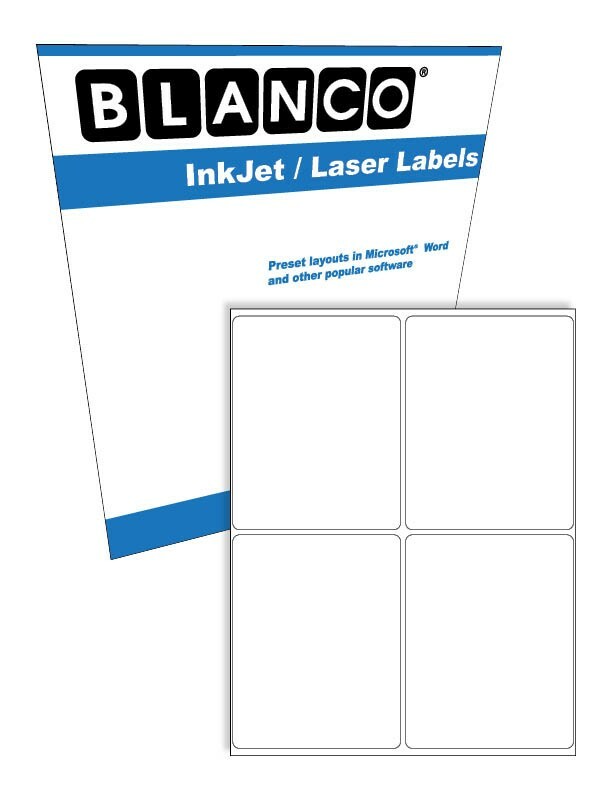 4 Permanent adhesive labels per sheet for use in LASER and INKJET printers. Compatible with Avery® Label 5168. Preset layouts in Microsoft® Word, Wordperfect®, Avery LabelPro® and other popular software programs. Designed to automatically feed through HP®, Canon®, Epson®, Xerox®, Apple®, and other printers. Note: Manual feed is recommended for HP Laser-Jet® and Apple LaserWriter® printers. These general purpose labels are approved for use in color laser printers. The brand names mentioned on this website are trademarks for their respective owners and appear for compatibility identification purposes only. This BLANCO® brand product is not manufactured or sponsored by the owners of these brands. Total cost for each quantity is listed in parentheses. Copyright © 2018 Blanco Inc., All rights reserved.